In 2008 and 2009 we used Pier 84 again. We added some audience activities (on-pier line toss, knot tying, and a spinach eating contest.) There was also musical entertainment. We were hosted last year by the Hudson River Park Trust, and city/state agency that is building a large waterfront park on Manhattan's west side from the Battery to 59th Street. And we were co-sponsored by Friends of Hudson River Park, and NYC EDC. 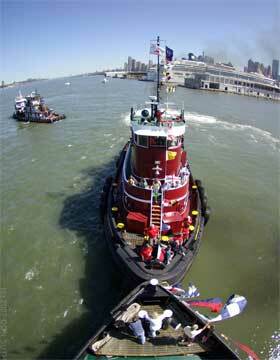 We plan to use Pier 84 going forward for future tug race events. will be on 4 September. Best viewing will be on the Circle Line 42 boat as we follow the tug boats up the Hudson River to the starting line and then back down to the finish line at Pier 84!